Elementary Art Lessons, Modeling and form, shadows in painting. Elementary Art Lessons, back to the basics. How to show form, shape, modeling of your subject in oil painting. Home > More painting lessons. > Elementary Art Lessons on form, shape. 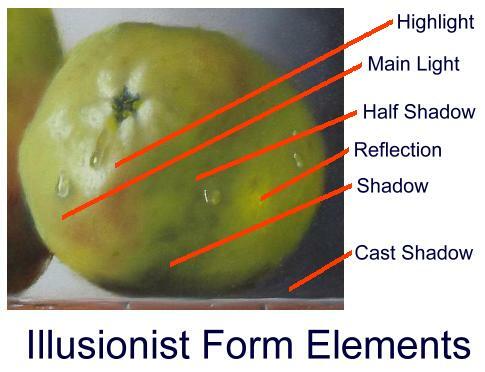 In representational art, realism, or classical, all depend on showing the objects form, and shape to achieve what is considered a "real looking" three dimensional object onto a two dimension piece of canvas. This elementary bit of art knowledge is called form, or modeling. It's what is done on the canvas to mimic what the viewer is seeing. It is something that is an integral part of realism. Without form and modeling, you are creating other styles of painting, abstract, cubism or some forms of folk art. It is the modeling that fools the eye into what appears to be three dimensional. And when done correctly, you really can fool someone into thinking the image is a real object. At art shows, I've had folks have to touch my paintings to see if the dew drops were not hot glued on! In Trompe Le' oil (fool the eye) painting, where the subject matter is painted with a very short focal plane, it can be extremely effective when the modeling is executed well. 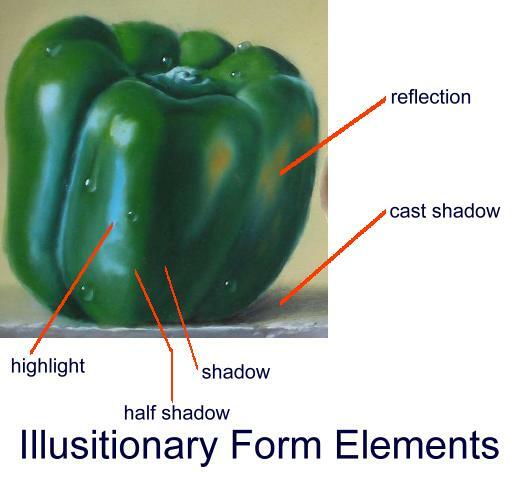 The following examples give the major components of objects painted and what each part is referred to when painting them. As time permits, I'll be adding more to this section of the site to help in showing some of the basic things we do as artist's that will become second nature to you in the future. This elementary art lesson is necessary in order to understand when a person speaks about how a painting is constructed. 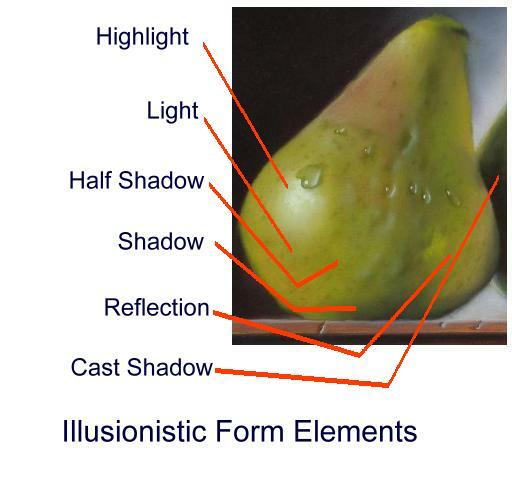 By showing you graphically (in pictures) what a half shadow, a reflection, or a cast shadow is, you will understand in the future what is meant by it. A few things to remember also. The texture and finish of an object will also help you in showing form. A hard shiny surface will have hard reflections and brilliant highlights. A mat or soft surface will have muted highlights and shadows. Compare the differences found between the pear surface and the glossy pepper surface. These 2 round objects have slightly different characteristics that help define what their shape is, (both are round) but the texture of their surface must be handled differently. Mat verses glossy. Just remember this also. Paint what you see, not what you think the item should look like. Back to the top of elementary art lessons on form and shape.